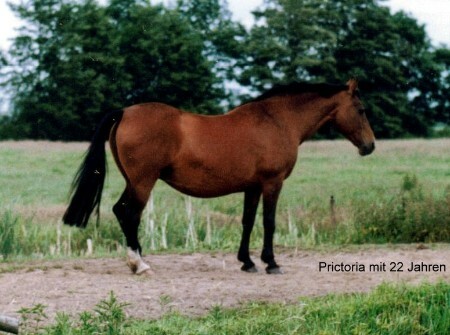 The origin of this mareline is East Frisian (Oldenburg) in the beginning of the 20th century, the first mare was registered 1918. The breeder Max Meyer in Dithmarschen, Schleswig Holstein was mainly breeding with this mareline. He was also the breeder of our Amrum I, who was 25 years old. The foundation mare of Max Meyer was Prictoria by Marmor and Irmelind by Rhadames and Brictoria by Akkord. Prictoria was 30 years old and has had 18 foals. The most of her daughters are also in breeding. Additional in Holstein Walter Werkmeister, Daldorf and Manfred Ternäben, Struvenhütten have bred with this mareline. Walter Werkmeister was breeding with the both full-sisters of Prictoria, Sitoria by Calvados I and Britta by Castro.